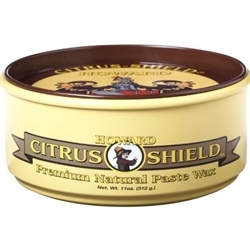 Howard Citrus Shield Premium Paste Wax is available in neutral (clear), Golden Oak, for all light brown shades, Walnut for all medium brown shades, Mahogany for all reddish brown shades, and Dark Oak for all dark brown shades. Citrus Shield provides a superior wax finish, along with the ability to enhance and tone the natural wood grain. Our unique formulation also contains a UV shield that helps protect finishes from the sun's harmful rays. FINISHED WOODS - Excellent for dealing and protecting the finish on all wood finishes, including antiques, furniture, cabinets, paneling, and wood floors. It enhances the natural beauty of the wood grain, and buffs to a brilliant, long lasting shine. UNFINISHED WOODS - Citrus Shield Premium Paste Wax is ideal for primitive pine, oak and other unfinished woods. The subtle color is distributed evenly into the wood, toning and highlighting the wood grain, while leaving a brilliant, long lasting shine. Neutral (Clear) Citrus Shield Premium Paste Wax is perfect to simply enhance the beauty and protect your wood without adding any color fillers. Mahogany Citrus Shield Premium Paste Wax will add the perfect red tones to your wood with reddish brown shades. Dark Oak Citrus Shield Premium Paste Wax is your answer for a superior wax finish on Dark Brown wood finishes.